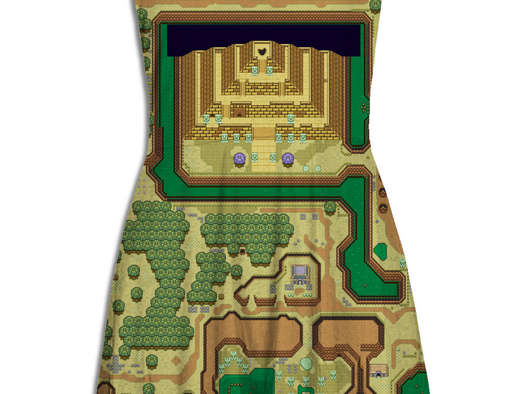 If you’re a girl (or a guy, I’m not one to judge), and you love A Link to the Past, then you’ll love this Light and Dark world inspired dress by Much Needed Merch! They sell each dress for € 31 / $ 40 and it’s reversible to show a map of either the dark world or the light world. For fans of the style they also sell a Toon Link inspired dress, a Ganon dress inspired by his Wind Waker form, men and women’s shirts inspired by the Link portrayed in the Zelda U trailer from the previous E3, a tank top inspired by the postman from Twilight Princess, and even a trendy Zelda outfit inspired by Hyrule Warriors. If none of these match your style then check out Console to Closet’s outfit inspired by Impa from Hyrule Warriors, combining fashion and Zelda in a polished manner. Some of the costumes listed above even come with dedicated accessories such as the spoils bag from The Wind Waker. For links and pictures of all the listed items, check the source and gallery! What do you guys think of the outfits? Let us know in the comments!